Talk title: Butchers cook - seasonal cuts for the autumn, winter and Christmas and how to cook them. For over 20 years, Simon has worked in this traditional trade. It is more than a job - it's his passion. 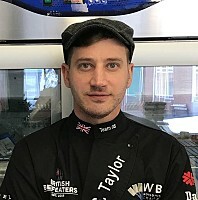 From the age of 13, he worked in his local village butchers in West End, Woking, and now Simon now runs his own shop in Oxshott, Surrey – Surrey Hills Butchers. Surrey Hills Butchers has won multiple awards over the years, including categories at the Surrey Life Food and Drinks Awards in 2015 and 2016, and he has been nominated three years in a row for the South of England category at the national Butchers Shop of the Year Awards. Simon is most proud of this position on the British Beefeater's Butcher's Team (Team GB). At the World Butcher's Challenge, Team GB finished 4th out of 12 nations, with Simon's beef shin winning 'best beef product in the world'. Surrey Hills Butchers have also extended their premises to include the Cow Shed – a venue where Simon offers bespoke butchery workshops for enthusiastic members of the public as well as professionals. Despite the death of the high street in recent years, butchers have not only survived; they are beginning to thrive. Within the foodie movement, butchers are becoming cool again. A butcher's role has evolved from simply cutting meat, to educating.